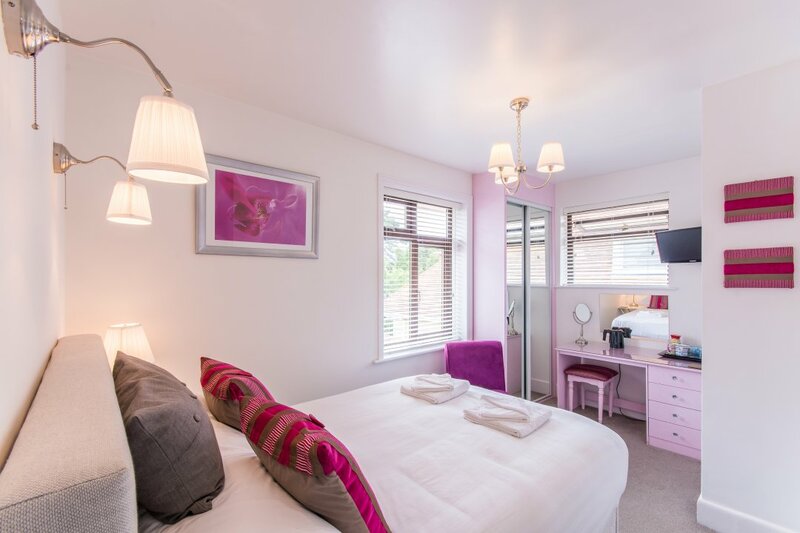 Our friendly B&B has a light, fresh and contemporary feel about it and we have six rooms to choose from: three double rooms, two twin rooms and one single room, all of which are en-suite. The bedrooms are situated on the 1st and 2nd levels. Unfortunately, we don’t have any ground floor bedrooms. The crisp white linen that we use on our beds is of a high standard and is contracted from a local company together with the white guest towels and bath mats. We use Cole & Lewis toiletries which are of excellent quality. 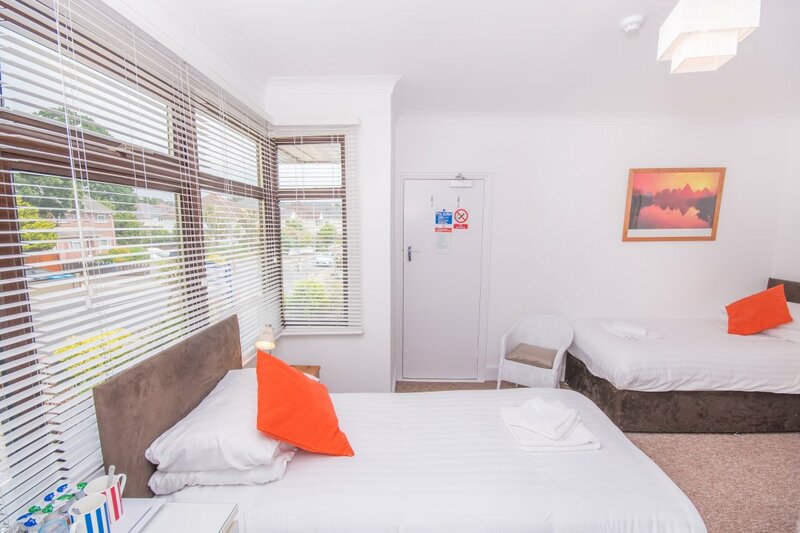 Room 1 is on the 1st level and has two normal sized single beds, one of which is in the corner of the room and the other is situated underneath the bedroom window. The room is at the front of the house overlooking the garden which is north facing. Room 2 is also situated on the 1st level and has a very comfortable king size bed. This room boasts some lovely Laura Ashley soft furnishings and is very light and airy. Room 3, again on the 1st level, is a single room with a 4ft bed so you can still stretch out. The room is south facing and overlooks the car park at the back of the house. It’s a very light, sunny and peaceful room. We have introduced a sailing theme in this room just to get you in the mood. Room 4, the last of our bedrooms on the 1st level is a good sized double room and is south facing, therefore gets plenty of sunlight. 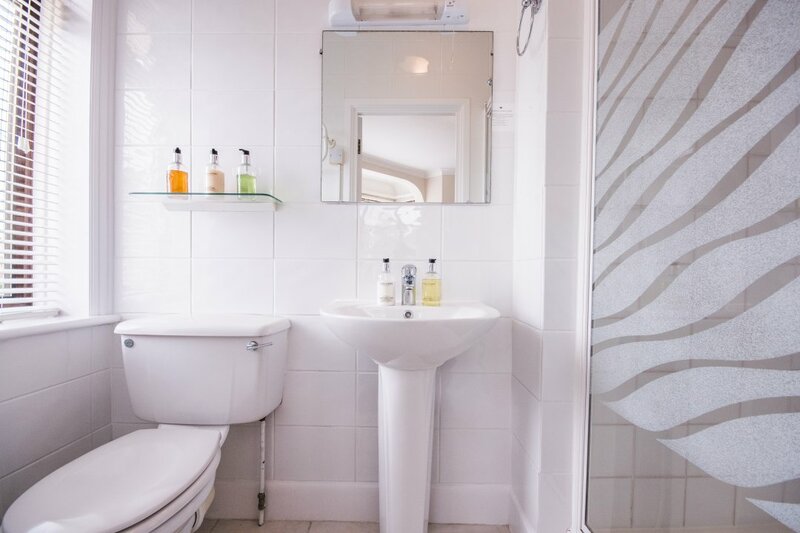 Although all of our rooms are en-suite, this room has the added bonus of a bath. A very comfortable and cosy room. Room 5 is a beautifully decorated double room located on the 2nd level. Although this room is at the top of the house all of the space within the room has been used effectiively to make this room work practically and comfortably. Room 6 is also located on the 2nd level and has two comfy single beds. The decor is fresh and clean and the room is light and airy. If you’d like further details on any of our rooms, please contact us. © 2019 The Mariners Guest House.